While reading the Confessions (Second Edition) by Saint Augustine I came across a pervasive quote about sin, “for the law of sin is that brute force of habit whereby the mind is dragged along and held fast against its will, and deservedly so because it slipped into the habit willingly”. This is a stunning quote because it shows how the slavery of sin develops and also sheds light on the responsibility which falls precisely on the sinner who needs to be redeemed. Today there is a fundamental knowledge that man is a ‘creature of habit’ and this is one of the things which we must study to understand salvation and how the Christ breaks through to sanctify man. In life, habits are neither good nor bad, but where a habit moves toward, by a specific impulse or desire is where it begins to be defined as a virtue or a vice. In virtue the habit is a good which leads to a progressive development in the world of persons. In vice the habit is an error in action which leads toward a more inhumane life, manifesting a lack in their being, or in other terms an ‘evil’ – the lack of a due good. 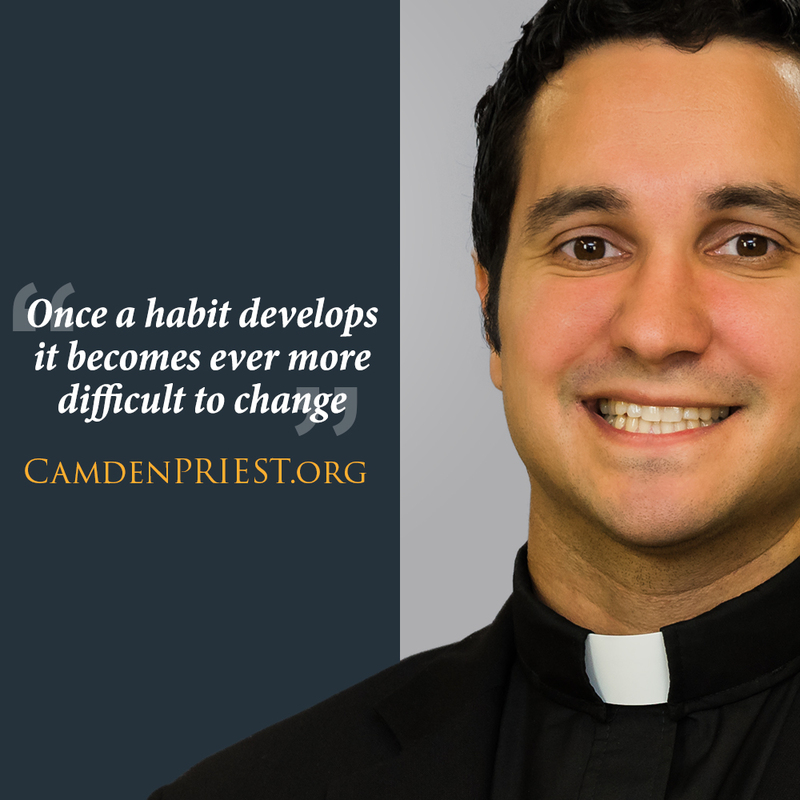 It is true that once a habit develops it becomes ever more difficult to change in the reality of human life. The next problematic principle of reality is ‘original sin’, which all persons inherit through birth. This is that ruptured relationship with God from which derives a natural inclination toward evil, the actuality of a darkened intellect, and a weakened will through the sin of Adam, for “by one man’s disobedience many were made sinners”(Rom.5:19). In this ‘original sin’ we encounter the authenticity of the words ‘by sweat of your brow’ in the development process of building virtues after these qualities are inherited. Therefore when a person is baptized, though that relationship is restored and the ‘original sin’ is removed, it is noted in the Catechism, this is when the ‘battle begins’. Though that original sin is cleansed we are still left with concupiscence and are desperately in need of habitual grace, as to a garden in need of a gardener. For example: If flowers are left to the scorching heat without constant watering they will soon be dead and they will no longer be able to be fully alive and bloom, to give that sweet fragrance to the world around it. Now, habit is taken from the word ‘habere’ in Latin, which means – to have. Therefore when we acquire a habit it is something that we as a person truly own, or rather it becomes ingrained into our being. This is how we become bares of sin or revealers of God’s grace…, and by reflecting on our countless sins, we notice that they are acquired by us and we truly have them, and this is the effect which creates the human desire to be redeemed or move toward confession. Thus parents’ conscience of this in their own lives, obviously desire baptism for their children. (hence even though the child does not necessarily know its need for redemption, the parents are fully aware of this child’s need, because they notice the necessity of grace and salvation in their own lives, and are knowledgeable of humanities need to be saved through the power of grace, which comes first and foremost through the sacraments. The goal in human life is what the Church proclaims as ‘the freedom of the Children of God’. In this freedom there is the habit of obedience to grace, which again I stress flows primarily through the sacramental life. In this, the person is formed by the infused virtues that move them toward holiness. Pope Benedict XVI notes that, “Holiness does not consist in never having erred or sinned. Holiness increases the capacity for conversion, for repentance, for willingness to start again and, especially, for reconciliation and forgiveness.” Therefore holiness is a transformation by the power of grace by the recognition of our sins before God, and the need of salvation: for if “we say that we have no sin we make him a liar” (1 John 1:10). Therefore by turning toward Christ, slowly or at times rapidly, the effects of grace change our habits of sin toward habits of virtue, from selfish motives, toward charity.